Jayne Mansfield was the blonde bombshell to rival Monroe and who constantly courted publicity. From ‘The Girl Can’t Help It’ to her final cameo role in Gene Kelly’s ‘A Guide to the Married Men’ she was adored by the public. However, her personal life impacted on her career as she sought solace in drink, drugs and Anton LaVey, the charismatic leader of the Church of Satan. Her fatal car crash in 1967 led to many conspiracy theories. 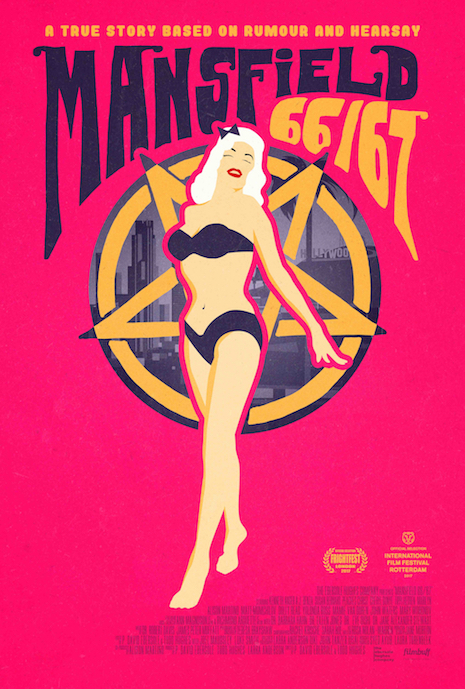 Made to coincide with the 50th anniversary of her death, MANSFIELD 66/67 is a Hollywood Babylon examination of the last two years of her life. Directed by P. David Ebersole and Todd Hughes (Hit So Hard; Room 237), the film features interviews with John Waters, Kenneth Anger, Cheryl Dunne, UK pop star Marilyn, actresses Tippi Hedren and Mamie Van Doren, drag queen Peaches Christ, alongside notable academics. Combining archive film footage and new drag routines specially created for the film, MANSFIELD 66/67 is a gloriously entertaining exploration of the lasting impact of myth, the rise of the Feminist movement of the 1960s and a celebration of ‘the first reality TV star’.